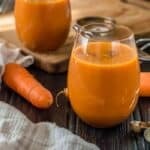 Jamaican carrot juice recipe – A classic Jamaican vegetable based beverage made from carrots, nutmeg, cinnamon and vegan condensed coconut milk. If you’re a fan of carrots then you’ll definitely want to stick around of this tropical thirst quenching beverage. 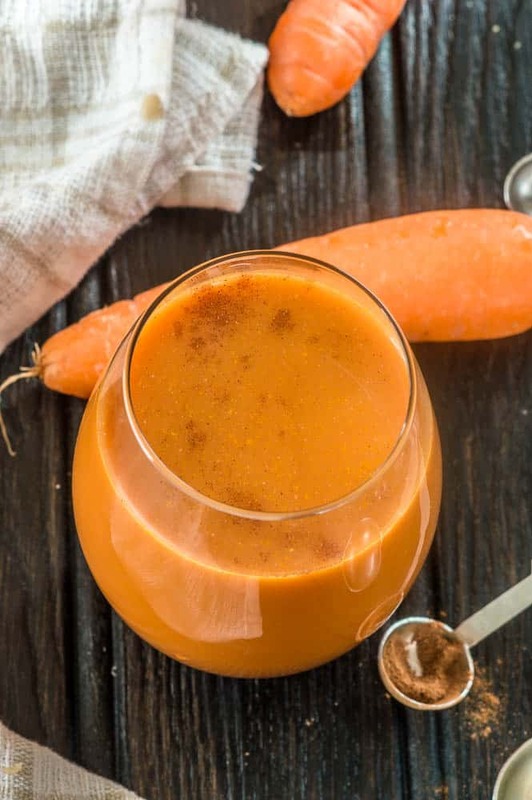 This isn’t just any old carrot juice recipe, it’s Caribbean so you already know to expect some spices here and there. I’m not one to disappoint so hopefully I will do my mother’s recipe some justice. What is Jamaica carrot juice? 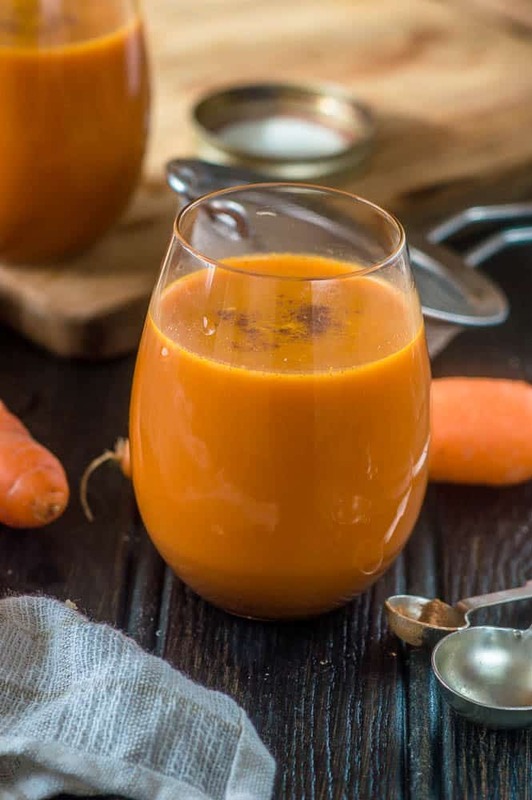 In short Jamaican carrot juice sometimes referred to as Jamaican carrot punch is a drink with contains of the following ingredients – carrots, water, condensed milk nutmeg, vanilla with a lovely hint of cinnamon to balance out of nutmeg. Growing up carrot juice was something we’d consume especially when we’d have lots of guests around. In all, I would summarise it as a delicious celebratory drink. It’s really simple to make this drink yet one that is guaranteed to impress your family and friends. You can make this drink using either a juicer or a blender. I wish I had the former due to the amass of leftover pulp from juicing with the aid of water. I’m way too frugal to discard the pulp, simply freeze it and reuse for some carrot cake or add it a smoothie. 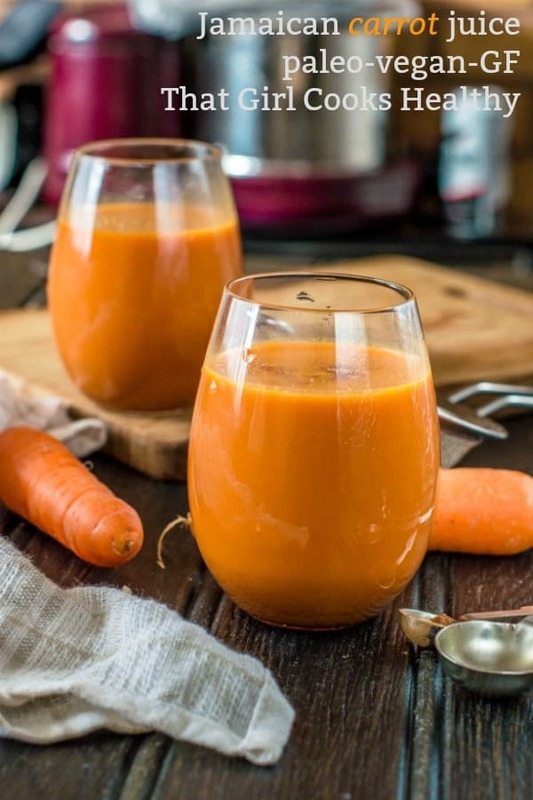 The blender will break down the carrots enough so that the excess juice can be strained prior to adding your condensed milk and spices. Ital carrot juice – let’s talk!! Now onto the beverage at hand, traditionally this carrot drink is made with condensed milk which we all know contains dairy. You guys know while I’m not quite vegan, I do embrace a dairy free lifestyle, so I managed to successfully replicate the conventional results, only using my homemade condensed milk or using this quick version of condensed coconut milk. This coconut condensed milk is my savour, if you’re lactose intolerant or lead a vegan lifestyle then I’m sure you will appreciate how difficult is it to substitute specific recipes from time to time. Since discovering this dairy free condensed milk I always keep a stash in my refrigerator as an alternative sweetener. How many calories in Jamaican carrot juice? Once completed use a strainer or cheese cloth to extract the juice from the pulp. Keep the pulp for another time to add to your baking, freeze it and re-use. Stir in the coconut condensed milk, nutmeg, optional cinnamon and vanilla. I made this for my Jamaican husband and wish you could see the smile on his face. You could see all the memories of Home running through his mind ❤️ Thanks so much for sharing this recipe! Aww you are more than welcome JAG. I wish I was there to see his smile too! !